Wright-Locke Farm’s youth education programs offer children a unique, hands-on experience learning about food, farming and the natural world on a historic working farm. 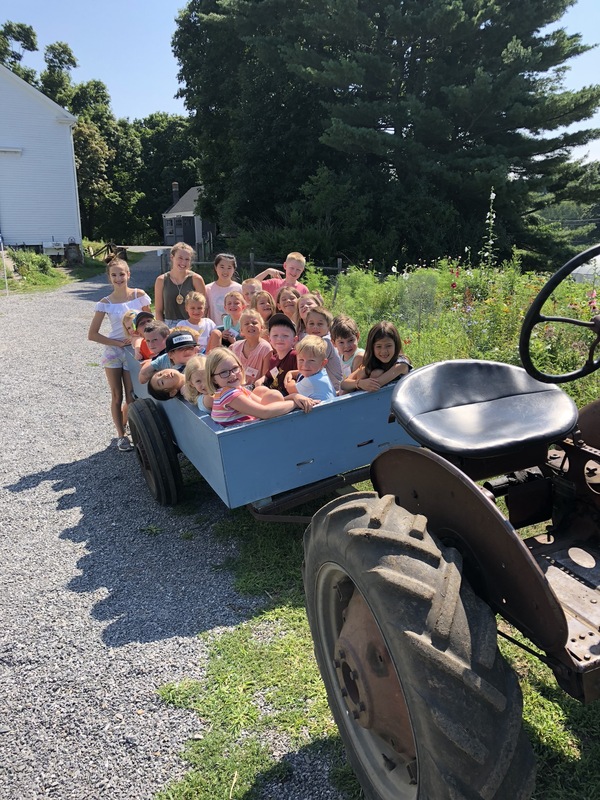 All of our programs include lessons and activities related to agriculture, the environment, nutrition, or natural science while utilizing the fields, pastures, barns, and wooded trails as our living classroom. Specific subject focuses include soil, compost, worms, plants, Wright-Locke farm animals (goats, chickens, honey bees), land conservation, farm history, select wildlife (plants, animals, insects, fungi), and more. Daily activities include visiting or caring for our farm animals, cooking healthy and seasonal dishes to try, tending our two youth gardens, and free choice time to partake in games, arts and crafts, and more. We currently offer season-inspired youth programs during the spring, summer, and fall months. 1. Log into, or create, your account via WLFarm.org. It’s quick and easy! We just need some basic information about yourself. Special note: Have you made a qualifying donation this year? If so, be sure to use the EXACT same first name, last name, and email address you used to make your online donation so that your donation and new account are automatically connected. If you’d like to change any of these pieces of information, you may do so by logging into your account. 2. Create a child profile for each child you wish to register. Similar to creating an account, you must provide some basic information about your child(ren) in order to register them for programs. You may edit this information at any time by logging into your account. 3. Prior to registering for a program, please be sure to read our Youth Program Terms below for information on our payment and refund policy, photo and video policy, and liability statement. *Please note that payment for a program is due at least 2 weeks prior to a program’s start date in order to guarantee your child’s spot in a program. 4. Register for a youth program! Choose a specific program (i.e. “Monday Spring After School Program”) from the drop-down menu on the Event Registration page. Select the profile of the child you wish to register for this program–you’ll be given the option to pay immediately by credit card or to pay later; we recommend opting to “pay later” if signing up for multiple programs or children so that you may pay for all programs with one credit card transaction on the Make Payment page (one check payment can also be mailed in lieu of credit card payment). To sign up your child for another program or to register multiple children for the same program, you will repeat this step. Did a program of interest sell out? If a program sells out, we have a wait list available–just contact our Education Director to let us know which program(s) you are interested in having your child attend. Many wait list families end up receiving notice about openings, you just never know when it will be (spring – summer). We notify wait list families in a chronological order as soon as a spot becomes available. Contact our Education Director with any questions. Payment for a youth program, made by credit card, check, money order, or cash, must be submitted at least 2 weeks in advance of the program’s start date. Failure to comply may result in the loss of your child’s spot in the program for which payment is owed. Tuition refunds are guaranteed up to 2 weeks prior to the start date of a program minus a $10 administrative fee. There will be no tuition refunds for cancellations made after a program has begun. No full or partial tuition refund or credit will be given for a child’s failure to attend any part of a program for which they are registered. A full tuition refund will be given in the event Wright-Locke Farm cancels a program. The Conservancy may take photos and digital video footage of activities throughout the educational program season for record keeping and publicity purposes. Participant names are never used in connection with these photos or videos. I realize injuries can occur from participation in Farm programs. I hereby waive, release, absolve, indemnify, and agree to hold harmless the Wright-Locke Farm Conservancy, Inc., their Board of Directors, instructors, or assignees, and the Town of Winchester from any claim arising out of injury to my child or myself. Should my child be taken to the hospital for emergency purposes, I hereby grant permission to the attending physician and staff to administer anesthesia, medical, X-ray, and surgical procedures as may be deemed necessary or advisable. I understand that every attempt will be made to contact me in an emergency. Please choose either AM or PM program, not both. Six sessions, running every Friday, 9:00 am – 12:00 pm, from May 3 – June 7. This program is for children ages 6 – 8 (grades K – 2). Sessions run every Monday, 3:30 pm – 5:00 pm, from April 29 – June 10. There is no session on Memorial Day (May 27). Sessions run every Tuesday, 3:30 pm – 5:00 pm, from April 30 – June 4. Sessions run every Wednesday, 3:30 pm – 5:00 pm, from May 1 – June 5. *This program is for children ages 9 – 11 (grades 3 – 5). Sessions run every Thursday, 3:30 pm – 5:00 pm, from May 2 – June 6. This program is for preschoolers aged 4 – 5 and runs Mon. – Fri. from 9 am – 12 pm. This program is for preschoolers aged 4 – 5 and runs Mon. – Fri. from 1 pm – 4 pm. This program is for preschoolers aged 4 – 5 and runs Mon. – Fri. from 9 am – 12 pm, with the exception of Thursday, July 4th. This program is for children in grades K – 2 (ages 6 – 8) and runs Mon. – Fri. from 9 am – 12 pm. This program is for children in grades K – 2 (ages 6 – 8) and runs Mon. – Fri. from 1 pm – 4 pm. This program is for children in grades 3 – 5 (ages 9 – 11) and runs Mon. – Fri. from 1 pm – 4 pm. This program is for children in grades 3 – 5 (ages 9 – 11) and runs Mon. – Fri. from 9 am – 12 pm. This unique new program is being offered jointly by Wright-Locke and Lexington Community Farms and will take place at both locations throughout the week. Participants will learn about agricultural production methods, gain skills and training with tools and equipment, and explore some of the issues surrounding food production and sustainability. The format is both experiential and discussion-based. For ages 14-17. Runs from 8:30 am to 1:30 pm, Monday through Friday.